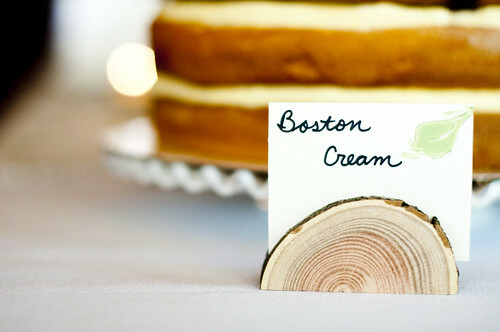 dessert labels, originally uploaded by ordinarymoment. Our last diy creations were these sign holders made from some more of those leftover branches. We made labels for our food and cakes so everyone would know the deliciousness they were eating. All we had to do was cut + sand each chunk and make a slot on the top for the label. Such easy, instant woodsy charm. It did take some extra time for all the creative touches, but really it was a labor of love, as they say. We both thought everything turned out pretty swell. Your wedding day is meant to be a reflection of you shared with your nearest + dearest. Though a bit unconventional, our day turned out so beautiful and we felt good about all the choices we made. We wanted our day to be special + pretty while making modest decisions that wouldn’t leave us with a huge bill as our new life together was just beginning. In the end, it felt like a great big happy collaboration with friends + family to have a fun, small celebration of this exciting new chapter in our life together. Wonderful memories, for sure.